The video got over 3 million views in 48 hours. Gorillaz can now add "broke a YouTube record" to their list of accomplishments. On Thursday, Billboard reported that the band's video for "Saturnz Barz (Spirit House)" racked up over 3 million views in 48 hours, making it the most successful debut for a virtual reality music video in YouTube history. The animated 6-minute video features the band's cartoon members exploring an old haunted house and outer space. Viewers can use their mouse to make a full 360-degree turn at any moment. 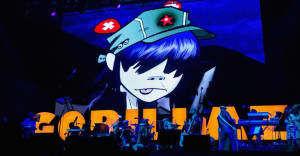 Last week Gorillaz announced that they would be releasing a new album, Humanz, and since then they have released four new songs and played the album in its entirety to a London audience. Humanz comes out April 28.